I have on my shelf Robert Harris’ An Officer and a Spy, and bought it (a pristine condition hardcover at the Goodwill bookstore to boot!) after seeing it on the TBR shelf of a close reading friend. 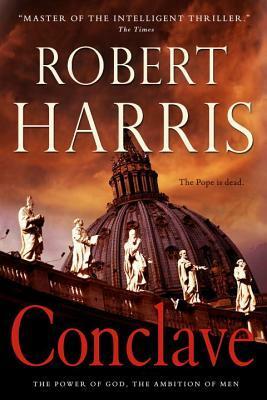 When we attended the Penguin Random House Canada’s Fall Preview in October 2016, Robert Harris’ latest, Conclave was featured. With just the tease of “The Pope is Dead. The Power of God. The Ambition of Men.”, it sounded most intriguing books, and was one I had to get my hands on immediately! Thankfully, PRHC provided a finished copy and I devoured it in just a few short days. Conclave truly was a fascinating read. The Pope (one modelled quite closely on Pope Francis, although Harris says this is purely coincidental) has died. Now 118 cardinals from all over the world must come together to cast their vote in one of the most secretive elections ever known – to elect their new Supreme Pontiff. Conclave was so intriguing, completely unputdownable, and utterly fascinating as it laid bare the internal political conflicts for some of the more ambitious men vying for the title of most supreme, the contest to become the holiest man on earth. I couldn’t put down this story about these men, and their cliques, groupings, political ambitions – from the traditionalists, to the liberals, those that sided with the now-deceased Pope, and the ones that are working hard to ensure their rise to Supreme. It also held some of the most intriguing gossip! So, in Conclave, the Dean of the Cardinals, Lomelli, must manage the entire process in order to announce to the world (with the white smoke) that a new Pope has been elected. Throughout this process, Lomelli struggles with his own spirituality, wrestles with his conscience on the suitability of the front running candidates, and his investigations into those that have the strongest possibility of being elected Pope. These four Cardinals are challenging the Pope: https://www.ncronline.org/blogs/distinctly-catholic/opposition-pope-francis-doubles-down. I’m telling you now, or maybe I’m just warning and possibly putting my personal feelings on it, but the ending to Conclave may rankle and will raise eyebrows for many. I’m still wrestling with the ending, my initial reaction was that it “cheapened” a highly fascinating and thrilling story. Indeed, I felt there were many edge-of-your-seat moments as to what direction the election was going to take as new revelations were always being exposed. Which of the leading Cardinals would be named the next Pope? The ending created a “really? you’re ending it with that?” kind of reaction from me. I don’t want to say much more about it because I don’t want it to influence your reading of a story that was again, so fascinating and interesting! Thank you Penguin Random House Canada for sending a copy of Conclave. Most appreciated! I now look forward to reading An Officer and a Spy!